High quality health services, good healing, high level of medical equipment and highly experienced staff are the components of the Spanish healthcare. The majority of the most highly skilled doctors and the best medical centres are situated in Barcelona. That is why it is possible to find here the correct solutions almost for any health problem. The question is how to find these correct solutions fast and spend the minimal energy and money for the search? How to find a qualified doctor, a real professional in the necessary area of medicine? The answer is obvious, you need health services of medical concierge or personal assistant. Health services by medical concierge and assistant save your time and nerves during the organization of the whole complex of high quality medical services. The aim of health services by our medical concierge or assistant is to meet your medical needs fast and to a good quality and assure the necessary communication between the patient and the doctor, this way saving the time of both and guarantee the mutual understanding between both parties. Corachan hospital was founded in 1921 and has been a leader in private medicine with a personalized approach to each patient for over 90 years. Corachan has the most advanced equipment and provides full medical service, so here you will find the most highly-qualified specialists in any areas. In case you are looking for a medical center/hospital with some specific area of specialization and need to be accompanied by an interpreter – call us. Maternity is the most important and responsible moment in the life of every woman, that is why you need to put yourself in hands of real professionals. A lot of expectant mothers choose Spain as a place to give birth to their child, as giving birth in Spain is always a guarantee of safety because all the diagnostic and therapeutic procedures meet the highest quality standards. That is why according to the rating results published by the World Health Organization (WHO) the Spanish health system is the seventh in the world. At the same time Spanish people are second in satisfaction with the quality of medical service. All Spanish hospitals are certified in the Health Ministery of Spain and are under its control. Catalonia is one of the parts of the world with the best health indicators among women and children. This result was achieved due to improvement in early disease detection, its control and monitoring. In particular it was the city of Barcelona which gained recognition as a Spanish capital of medicine attending around 16.000 foreign patients a year and applying the most advanced technologies, as well as joining the leading European professionals. What is needed for the childbirth in Spain? In order to give birth in Spain it is not necessary to have a residence permition, although you do need a domicile registration. However, when you proceed to the birth certificate for your baby, you will have to choose either Spanish or Russian nationality. It is important to know that the child born on the territory of Spain has right to get Spanish nationality when he/she is 18 years old with no need to live in Spain for 10 years according to the Spanish law. Which hospital is the best for giving birth? You can give birth both in public and private fee-based hospitals. Of course, giving birth in a private hospital is much more comfortable. All private hospitals are provided with light and comfortable individual petient rooms and offer first-class service with personalized approach and permanent care. That is why these private hospitals are called “hospitals hotels”. Here you will find highly-qualified specialists and the most advanced equipment. Which advantages do the private hospitals have in Barcelona? Helping to an expectant woman is the main aim of the staff of the private Catalan hospitals. Here they do their best to guarantee vaginal birth and Caesarian operation is done only in cases when there is real need in it. As soon as the baby is born, it is put to its mother’s breast so that she could breastfeed him for the fist time. Words cannot describe this unique experience. Here you can have the experience of a lifetime under the nonintrusive care of real professionals. The newborn baby is examined and measured by a pediatrician. The hospital’s staff will tell you how to breastfeed the baby correctly and how to take care of him. If you have had a baby girl you can also take the advantage of ears piercing if you prefer. After having birth the woman spends in hospital on average three days in case of vaginal birth and five days in case of Caesarian operation. The recovery time may be up to three weeks. During this time the mother and the baby should see the gynecologist and the pediatrician regularly. The best high-quality service in childbearing in Barcelona is offered by such hospitals as Teknon medical center, Quiron, Dexeus, Corachan, Planas and Maternity and children’s hospital Sant Joan de Deu. The company Kakdoma BCN will be glad to answer any of your questions, offering the best health services and the accompaniment by your personal assistant-interpreter during your pregnancy time and stay in Catalonia. The company “Kakdoma Barcelona” visited the hospital “Teknon” in order to get to know better this famous establishment and take an interview to the doctor- gynecologist Elena Castellanos. Elena studied medicine in the University of Valladolid and currently she is working in the hospital “Teknon”. 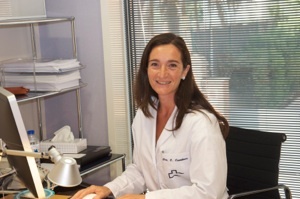 Together with other doctors she is part of the team of gynecology and obstetrics in honor of Valldecasas. Apart from a large experience in the sphere of gynecology, Elena has also been a member of the Students International Federation of Medical Sciences.That helped her to have her practics in diffferent countries, such as the United States, Italy, Holland, France, Sweden, Yugoslavia, Turkey and Nigeria. The long way of her professional carrer and large experience helped her to broaden her view on the gynecology. Elena, you have a wide and diverse work experience. Why did you get interested in the gynecology? Since childhood I wanted to help people, so that i started to study medicine, the gynecology in particular, cause I hd always been interested in the theme of maternity. I participated in the international programme of the Students International Federation of Medical Sciences, that helped me to widen my view of the world and better understand the problems which exist in this sector in the whole world. Moreover, in 1990 I studied in Russia, that is why I speak a little bit of Russian, apart from Spanish, English, French, Italian and Arabic languages. Which gynecological services does Teknon offer to its clients? I have been working in teknon since 15 years and I can say that our team works in different spheres. First of all, of course, we are specialized on the gynecology, it includes everything connected with female reproductive organs, incontinence of urine, etc. We also work in the sphere of obstetrics, that means the prenatal care and giving birth. From another side, we make gynecological operations and offer ultrasonography and computerized diagnostics services. We also make the sterilization and offer the services of contraception. Apart from that, we are specialists in prevention of such illnesses as the breast cancer or sexually transmitted diseases, alongside with the healing the symptoms of climax and so on. Recently the health care center Teknon has been acquired by the hospital Quiron. Are there any differences between these two clinics: Teknon and Quiron? These two hospitals were banded some months ago with the commercial purposes, in order to make the process of buying machines easiers and to improve the control strategy. Both centers are quite big and possess the most innovative technology. As for the differences, you can see them, for example, in the birth giving process. So, in case of Caesarian operation the hospital Quiron prohibits the presence of the relatives during this process, while Teknon allows the presence of one member of the family. As for the politics of yhe center, I don´t think there willl be any changes. We continue working in the same way and even in case something changes, we will continue working with the same devotion as professionals. A lot of women from different countries choose Teknon as the place to give birth. The famous singer Shakira and the Spanish princess Cristina decided to give birth here. What distinguishes Teknon from other medical centres? First of all, I would like to notice the excellence and high professionalism of our doctors. Teknon possesses the most innovative technology which let us fight with any problems. Of course, the great communication with the patients and friendly atmosphere. The centre itself is notable for the special charm and elegance. I am working in Teknon with a lot of pleasure. There are prospects for the personal and professional growth. We held constant meetings with other doctors with the aim of experience exchange, education and permanent improvement. As for the giving birth in Teknon, which is the first step for the prematal control in Teknon? Which documents are necessary for it? It is very simple. You should call out centre, tell the name of the insurance company (if you have the medical insurance) and explain that you need a private visit and decide the time. As for the documents, in this case you only need the passport for the right client registration. Could you describe approximately the process of prematal control? At the first meeting, we get to know the client and listen to her story. Then we pass to the medical examination and make the ultrasonography. In the beginning, the visits to the doctor are more frequent. Then the frequency of the visits depends on how the pregnancy goes. Apart from other examinations, we make the blood test which lets us find the Down syndrome and other gynecological illnesses, starting by 9 weeks of pregnancy. So, in case of the positive result this analysis helps us to prepare the parents in case they decide to continue the pregnancy or, in the contrary case, if they decide to stop the pregnancy within the Spanish law. When is the client put in the health centre Teknon? The client´s preshedule placement in the health centre has place only if there is a problem. If there are no problems, the pragnant woman stays at home and visits the doctor only for the periodic examination. If the patient feels the symptoms of giving birth, she calls the hospital where she gets the instructions about how to behave. Teknon has the phone of 24 hours support in order to help the patients in any situation. Could you tell us more about the process of giving birth? Does the doctor who controls the patient´s pregnancy stays there? One of our main rules consists in never leaving the patient without attention. There are two options: private childbearing and giving birth with the health insurance. In case of private giving birth or so-called insurance of compensation, the doctor who controlled the pregnancy, is obliged to be at the childbearing. If it is a normal medical insurance, one of our doctors on duty will always serve the patient. It is a principle of the organization of our work. We also try to introduce our patients personally to all the members of our team. Apart from that, the health centre Teknon has a gynecologist on duty in case urgent activities are required. Are there birth attendants who speak Russian? Can the interpreter be at the childbearing? As far as I know, we don´t have birth attendants who speak Russian but this problem is easily solved thanks to the accompaniment service. Taking into account our method of work at the international level, the interpreter can be next to the parturient woman. Nowadays a lot of people talk about the natural childbirth. From your point of view, which type of childbirth is the most reasonable? It is a very individual question because everything depends on the pain barrier. In general, the parturient woman can ask the natural childbirth, but if the pain becomes stronger, she can ask for the anesthesia. In the process of giving birth with the anesthesia there is nothing unnatural because all the process goes normally and the only differences is that the woman doesn´t feel pain. What can you advise about the positions during the birth? Which positions are used in the health centre Teknon? Does the childbirth in the water or swimming pool exists? All the maternity rooms of the centre are individual and have special beds which can be adapted to the position in which the woman feels the most comfortable. We don´t hold birth in the water or swimming pool. How many days do the morther and the baby stay in the hospital after the delivery? It always depends on the situation and mother´s and baby´s condition. I fit is the vaginal birth without any problems, the period of stay in the hospital is 3 days. In case of Cesarian operation, it is 5 days. Anyway, the patient feels comfortable in the hospital: all the rooms are individual, have a bathroom and a bed for the accompanying person. We can even say that our health centre looks like a hotel of 4-5 stars where our patients are offered a nice atmopshere, constant attention and the best conveniences. When the baby is born, does the hospital give the certificate of birth? How is the registration of the newborn? Yes, we give a special document with which the parents go to the Civil Registry Office in order to get the birth certificate. Does Teknon have options of healing for the couples who have the impregnation problems? To solve this problem we offer different types of the artificial insemination like, for example, “invitro fertilisation”, artificial insemination, donation of ovules and embryos and so on. We would like to know your opinion about the best age of giving birth. Is it established? Th best age for giving birth is when the woman feels ready for that. From 35 years the ovaries start to get old and as a result, the level of fertility is reduced, at the age of 40 the process worsens. All this can lead to the difficulties with the impregnation. Although, the impregnation should take place when the woman feel ready to the maternity. The company KakDoma BCN will be glad to answer any of your questions, offering the best service and accompaniment by your personal assistant-interpreter during your pregnancy time and stay in Catalonia. Catalonia is a perfect place for health tours. Due to such favorable factors as climate, sporty lifestyle, mediterranean cuisine and pleasant environment, you will get better much faster and forget about your weakness. There is a big variety of health resorts (balnearios) in Spain. Your personal assistant in health tours will arrange a perfect health-improving holiday for you in the best health resorts located in the mountains famous by mineral and thermal waters or by the sea where you will not only enjoy the fresh air full of iodine, but also get inspiration. In case you need an immediate relaxation we will recommend you one of the best health resorts and spa centers located in Barcelona and its surroundings.